Click here to download a PDF copy of the Pilz Machinery Directive Poster, or e-mail marketing@lca.co.uk to request your free printed copy and we'll send one in the post (UK business addresses only). 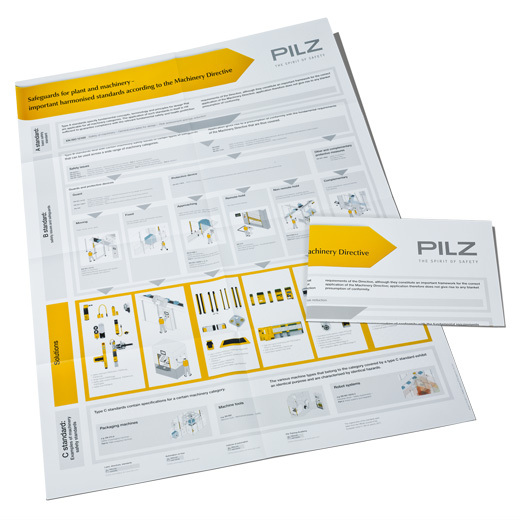 The new poster, entitled Safeguards for plant and machinery, offers an overview of the standards, while also highlighting Pilz products that can help machine builders comply with the standards. In addition, webcodes provide quick access to further, more detailed information on the Pilz website.